DestinSharks.com is a blog mostly about boating and fishing in Florida waters. But, it's author is a big fan of Google Earth technology. A few months ago he wrote an application to show tide predictions in GE for example. A few weeks ago, he started showing me his pet project for the last few months. 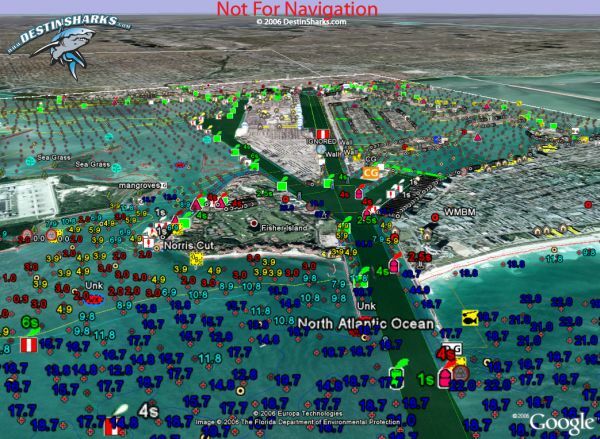 He has been developing a way to show detailed marine vector charts in GE. These charts are colorful and beautiful! DestinShark's technique uses KML regions to help declutter the detail as you zoom out and bring the detail back in as you get in close. So, for example, when you get close enough you get buoys, lights, and even depth numbers. He is using the NOAA ENC vector charts covering US waters. So far he has completed a few of the 600 or so charts available from NOAA, and has released these charts for beta testing. Read the details here, and sign up for the beta test to get the network link. I highly recommend you check this out if you are into KML and/or cartography. If you are into marine charts, I think you'll be excited to look at these charts for your waters once he gets the rest of the 600 charts done. I've referenced Virgil's work too. It looks like he's finally got all of NOAA's charts and data compiled. Using views of his that integrate NOAA's bathymetric data yields some pretty serious eye candy. I've been using Google Earth to create comprehensive landmark and caution area commentary on kayaking areas in the US east coast. Come on by if you want to have a look or to write about it.